Explore Uluwatu & South Bali Full Day Tour 10 Hours starts with visiting Garuda Wisnu Kencana, Bali Cultural Park with huge monument, classic attractions, where fantasy experience and modern technology blends. Next stop will be Padang Padang Beach, and then Uluwatu, one of Balinese Hindu Temples located at right on the petrifying hill with the deep rocky beach valley exist in the right and left side. Uluwatu Temple has magnificent view of the Indian Ocean and sunset as a backdrop, you will watch Kecak Dance here, Kecak and Fire Dance is a spectacular traditional dance tell story about fragment from the Ramayana, the Hindu epic. Your trip will be ended with dinner at Jimbaran Beach, a beautiful beach in the southern of Bali. Dinner is served right on the beach opposite to the ocean. Tour end and back to hotel. Located at Jalan Labuan Sait, in the village of Pecatu, Bali. 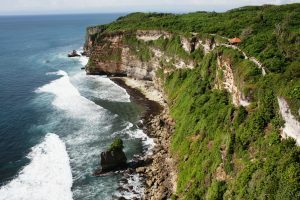 Located not too far from the tourist area of ​​Uluwatu Temple and one of place will be visit on Uluwatu Tours. To get to this beach, we had to descend the stairs are made in the cliffs. After a few yards down the stairs we are greeted by the sun. It turns a dark alley behind the beach there is incredible beauty. 13.00-14.00 – Lunch at your account. We can provide optional lunch at IDR 100.000/person. Uluwatu Temple sits on a 70-meter-high cliff protruding above Indonesian Ocean. The main site of Uluwatu Tours is visiting this temple. There are hundreds of monkeys roaming along the path outside the temple. A small forest lies at the front and hundreds of monkeys dwell here. They are believed to guard the temple from bad influences. Kecak and Fire Dance is a spectacular traditional dance tell story about fragment from the Ramayana, the Hindu epic which finds its expression in many forms was held near of Uluwatu Temple. We will watch this dance during Uluwatu Tours. Kecak dance is that the accompanying music is provided by the human voice, the gamelan suara, a choir of a hundred men or more sitting in concentric circles, swaying, standing up, lying prone as the story develops. Enjoy your dinner at the beautiful Jimbaran Bay, famed for its seafood barbeque while you can feel the breeze of Indian Ocean and viewing aircraft landing and take off from Bali airport.